Apparently, it’s THAT time of year (no, NOT Christmas – the other “THAT” time of year): back-to-school! (I say “apparently” because I’ve been out of school for longer than I care to admit.) Or it’s back-to-work or back-to-the-gym or maybe even Back to the Future (!) for you. Wherever (or whenever) your day takes you, these balls make a perfectly portable pick-me-up. And in this more hectic time of year, what’s more magical than hearing that a recipe is no-bake, and only requires five wholesome ingredients? Much easier than homework, I promise! Apparently (again), I am very, very late to the “ball” train. Or wagon. Or whatever you want to call it. Seems every other self-respecting food blogger out there already has a plethora of energy ball / snack ball / protein ball recipes on the go, incorporating myriad ingredients (both my father and my junior high school English teacher would be so proud of me for incorporating both “plethora” and “myriad” in the same sentence). But one of my life mottoes is “better late than never” – much to the chagrin and annoyance of my co-workers and carpool buddies, punctuality is a MAJOR struggle for me – so I decided to get into the fray. There are recipes out there that taste incredibly good but aren’t so good for you. There are recipes that feature wholesome, natural ingredients exclusively but just don’t quite have the macronutrient profile I am looking for (check out the details of what I look for in a healthy snack). 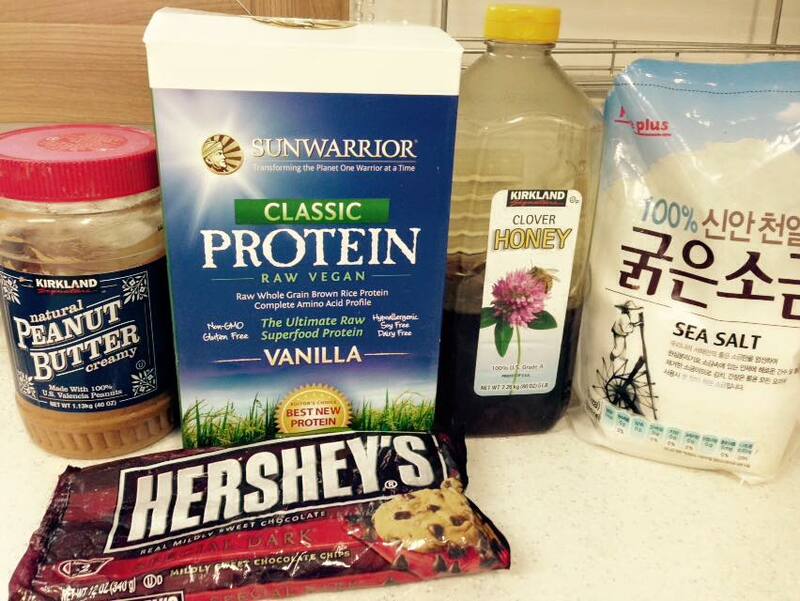 There are recipes at the other end of the spectrum that seem to consist of nothing but protein powder and stevia. 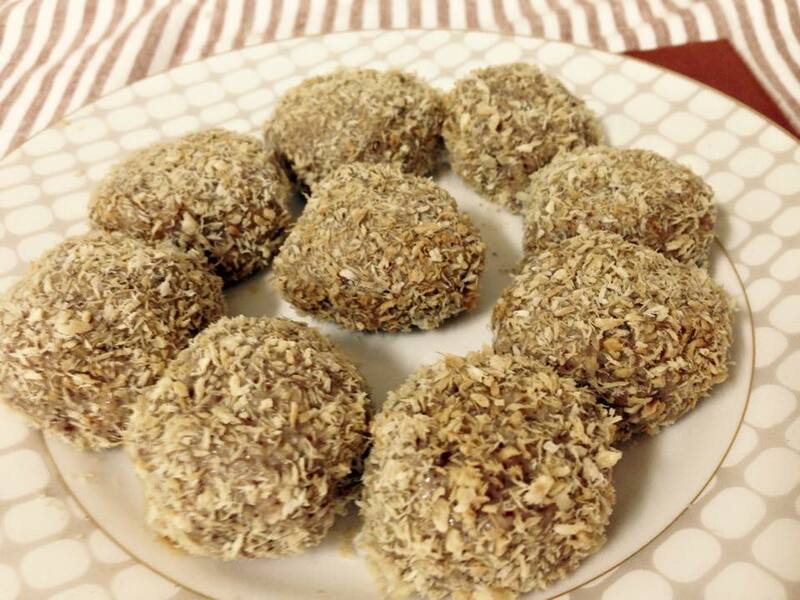 I wanted to strike a balance: delicious, wholesome balls with a little bit of added protein. 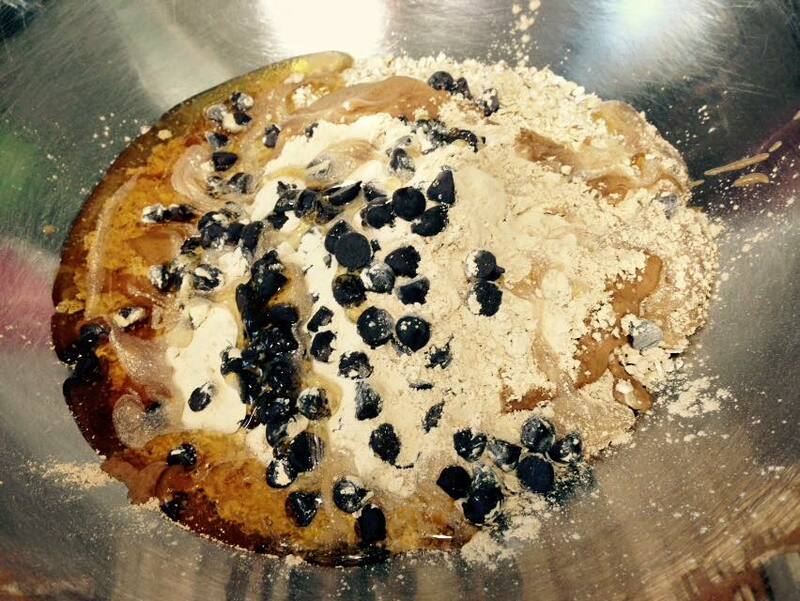 I’ve loved using SunWarrior brand plant-based protein powders in other DIY protein bar recipes, so I decided to add a few scoops to this recipe. If you’re not vegan, you can also substitute your favourite whey-based protein powder, but note that you may need to increase the liquids in the recipe slightly (or add a touch of almond milk) as whey protein tends to be quite dry and absorbs a lot of liquid. You’ll want a base mixture that holds together and is only slightly sticky to handle so that you can easily roll it into balls. Not only is it a no-bake recipe, it’s a 1-bowl recipe! These balls also contain whole grain oats so they are NOT Paleo – and since they are not Paleo, I decided to use my much-loved peanut butter (but you could also use any other nut butter or even the sunflower seed-based SunButter to accommodate peanut and/or tree nut allergies). I think all other recipe tweaks and substitutions are self-explanatory, so let’s get to it (oh, and I highly recommend that you INCLUDE the sea salt, unless you are on an explicit reduced-sodium diet – it just really makes the peanut flavour POP!). 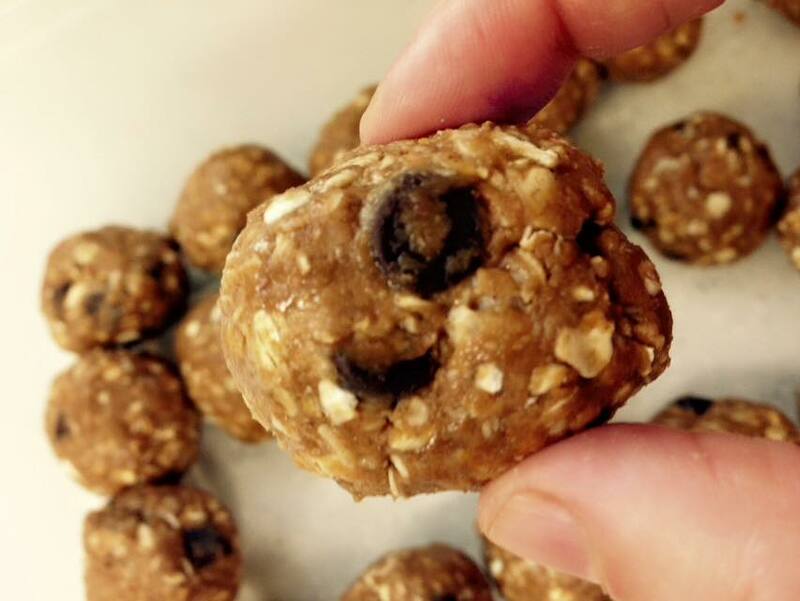 Everything but the oats – the 5 ingredients (+ sea salt) that you’ll need for this recipe! Wherever (or whenever) your day takes you, these balls pack protein for a powerful, perfectly portable pick-me-up, anywhere, anytime! 1. Mix all of the ingredients in the order listed above in a medium mixing bowl (no food processor required for these balls!). 2. Shape into 20 ping-pong size balls using your hands and/or a small melon-baller or small ice cream scoop (you could also make 10 bigger balls – just note that the nutritional information presented below will be doubled for each ball). 3. Place on parchment (or waxed) paper in a container and refrigerate until firm (at least 30 minutes). Store in a resealable container in the refrigerator – can be enjoyed straight out of the fridge or after a few minutes at room temperature for a softer texture. These can easily survive being packed in a to-go container and added to a lunch bag for school or the office or the gym!